Renovated barn situated on the edge of the scenic Mendip Hills with spectacular views. 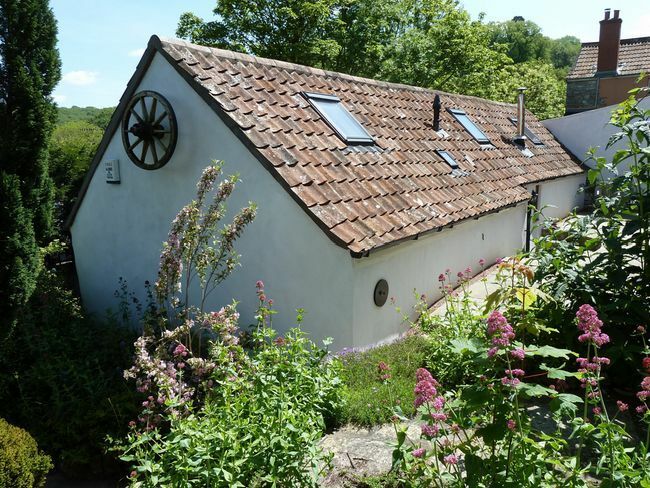 The gorgeous garden has a plunge pool and hot tub helping to make this property the perfect base for exploring the Somerset Levels and beyond. Set in the historic village of Banwell this unique property is only a short drive away from nearby shops cafes and pubs. An expanse of woodland lies behind the cottage and the local area is perfect for walking cycling and other outdoor pursuits. The ancient city of Bath is only 45-minutes drive away offering a range of activities from enjoying the Roman Baths to shopping and eating out. The property has been renovated to a contemporary standard whilst still retaining its traditional feel with exposed beams and stained glass. Outside a raised decking area offers panoramic views across the Somerset Levels. The split-level property is accessed by steep stone steps (which may be unsuitable for those with specific access requirements). The ground-floor bathroom offers a bath over bath shower and towels. The lounge also located on the ground floor is the heart of the house with log burner (first basket of logs included) TV Blu-Ray player and stereo with bluetooth connectivity. A range of books and DVDs is also provided. It is the perfect place to enjoy an evening in. A small galleried area with seating overlooks the lounge. The kitchen/diner can be found on the lower ground floor and is stylishly decorated with a gas oven and hob fridge with ice compartment microwave washing machine and dishwasher. The ground floor master bedroom offers a king-size bed. The second bedroom situated on the upper floor contains twin single beds. Outside there is a small patio area and steep stone steps lead up to a raised decked area complete with outside seating and BBQ from which to enjoy the views on warm evenings. A plunge pool and inflatable hot tub is also provided between May and September with pool inflatables and garden games.